With Lifeline from JFS of Metrowest, help is just the press of a button away. JFS of Metrowest and Philips Lifeline are pleased to provide members of the Metrowest’s senior community with the country’s most trusted medical alert service. For more than 30 years, Lifeline has enabled millions of people to live with greater independence, peace of mind and dignity in the place they feel most comfortable – their own homes. For family caregivers, the Lifeline service provides much needed support and reassurance as they balance the needs of their loved ones with the demands of their own busy lives. If you have any questions, would like to talk about your particular needs, or are ready to begin service, click here to visit Lifeline or call 866-674-9900 ext. 4380. Six location technologies designed to help locate seniors home or away, indoors and out. Features AutoAlert, proven fall detection that has benefited over 300,000 seniors, and automatically detected over 150,000 falls. 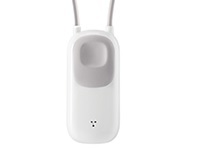 The lightweight button is waterproof and has a long battery life. Give the gift of independence and introduce seniors in your care to Philips Lifeline.